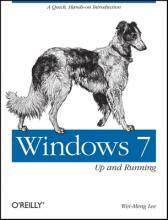 This compact book offers the quickest path for Windows XP and Vista users to get started with Microsoft's new Windows 7 operating system. Long before its official release, Windows 7 has been well received by the millions of users who took advantage of the public beta and release candidate programs. Microsoft has learned from the mistakes of Windows Vista, and Windows 7 shows it - this new OS is a more stable, faster version of Windows. With "Windows 7: Up and Running", you'll become productive immediately. This guide shows you what's new, what's changed, and everything you need to get going, from installing Windows 7 to configuring it. And you'll quickly get oriented to the new user interface and built-in applications. Windows 7 is poised to be a big hit among PC users, and with this handy guide, you can be up and running with this new operating system right away. Wei-Meng Lee (Microsoft MVP) http://weimenglee.blogspot.com is a technologist and founder of Developer Learning Solutions http://www.developerlearningsolutions.com, a technology company specializing in hands-on training on the latest Microsoft technologies. He is an established developer and trainer specializing in .NET and wireless technologies. Wei-Meng speaks regularly at international conferences and has authored and co-authored numerous books on .NET, XML and wireless technologies. He writes extensively for the O'Reilly Network on topics ranging from .NET to Mac OS X. He is also the author of Windows XP Unwired and .NET Compact Framework Pocket Guide, both from O'Reilly Media, Inc.